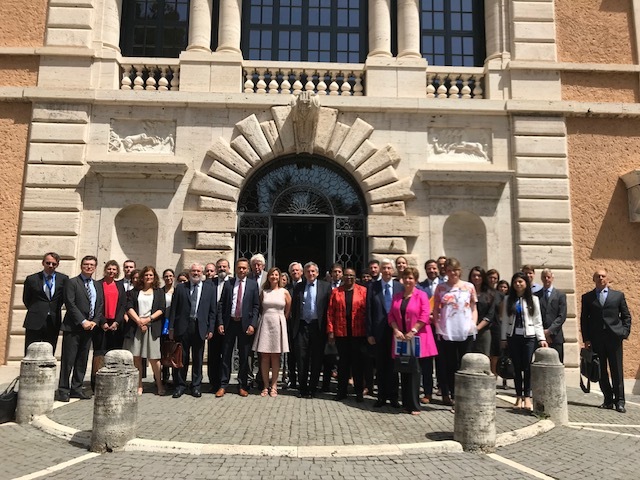 Rome, 11 June 2018: Representatives of Cyprus, Greece, Italy, and Malta met at the Villa Massimo in Rome this morning at the invitation of the International Commission on Missing Persons (ICMP). Participants at the meeting asserted their intention to develop a joint process aimed at enhancing cooperation among European and other States to account for migrants who have gone missing or who have died in the Mediterranean region. In the statement, they stressed that this process will be open to other states, including other European states and countries of migrant origin. The immediate objectives will include assessing the scope and extent of investigatory capacities and proposing strategies to redress possible shortcomings. Speaking at the opening of today’s meeting, ICMP Commissioner Wim Kok noted that in view of the complexity and enormity of the challenge “no one country can face this issue on its own”. He said it was critical “that States come together to harmonize their efforts and share responsibilities and that they reach out to countries of migrant origin.” Mr Kok said ICMP is prepared to work with countries in the region in order to help them set in place an effective system that will enable them to share information and coordinate their efforts to address the issue of missing migrants. Prefect Mario Papa, Italy’s Extraordinary Commissioner for Missing Persons, noted that “since the shipwrecks near Lampedusa in 2013, the office of the Commissioner has been supporting activities to identify victims,” and that greater cooperation between government institutions and specialist international organizations “is clearly desirable”. The statement by participants notes that ICMP can provide a secretariat and other support for the Joint Process as required.